Craft works are patiently and lovingly made by hand, often with the aid of techniques passed down over generations. For many viewers and collectors, they come with associations of leisure, quiet focus and peacefulness. Yet a new exhibition at the Henry Sheldon Museum of Vermont History in Middlebury turns to three distinct categories of handmade items to address contemporary global crises: climate and refugees. "World Challenges" features wood carvings by Chuck Herrmann, sculptural vignettes by Sarah Ashe and Syrian textiles from the collection of Sansea Sparling. According to Sheldon executive director Bill Brooks, the exhibition — which was planned before the November 9 election — unfolded organically after he offered to show a newly completed work by Herrmann. Ultimately the show became a collaborative effort of Brooks, associate director Mary Ward Manley and archivist Eva Garcelon-Hart. Herrmann, a Shoreham-based timber historian and wood carver, generally carves birds. When his grandson, Sam Herrmann, was in college, the two began to talk about climate change. Sam's passion for the subject led to a new project for the older artist: "Arctic Triptych," a carved menagerie of that ecosystem's wildlife. For two years, Herrmann worked on rendering his three-piece basswood scene. The centerpiece of the tabletop sculpture showcases creatures threatened by the Arctic's shifting environment: Among them are the requisite polar bear on a tiny ice floe, a beluga whale and an Arctic tern. At the center of the display stands an obelisk that looks very much like the Washington Monument. Exhibition text explains that the tower represents humans' environmental impact and was inspired by the monolith in Stanley Kubrick's 2001: A Space Odyssey. With small-scale works by Ashe, the show shifts gears from climate change to fraught human migrations. Using a range of materials, including translucent Thai paper, reeds and a beeswax encaustic medium, the Middlebury artist latches onto the vessel as a representative form for the refugee crisis. In "Desperate Crossing," a paper boat sits atop a piece of driftwood, filled with faceless people fashioned from teabags. They're no more than an inch or two tall. "No Way Out" is a delicate paper-fiber teacup in which a tiny boat drifts against a painted blue background. Referencing a different kind of container, "Waiting" is a wall-mounted sculpture of small white paper "tents," enclosed in a perimeter of knotted thread. Ashe does not always make clear which refugee populations her works represent, though exhibition text offers baseline international statistics on displaced populations. The anonymous miniatures and fragile materials suggest a narrative of victimization and human desperation. Through her work, Ashe writes, "I continue to search for understanding and routes to alleviating such suffering." 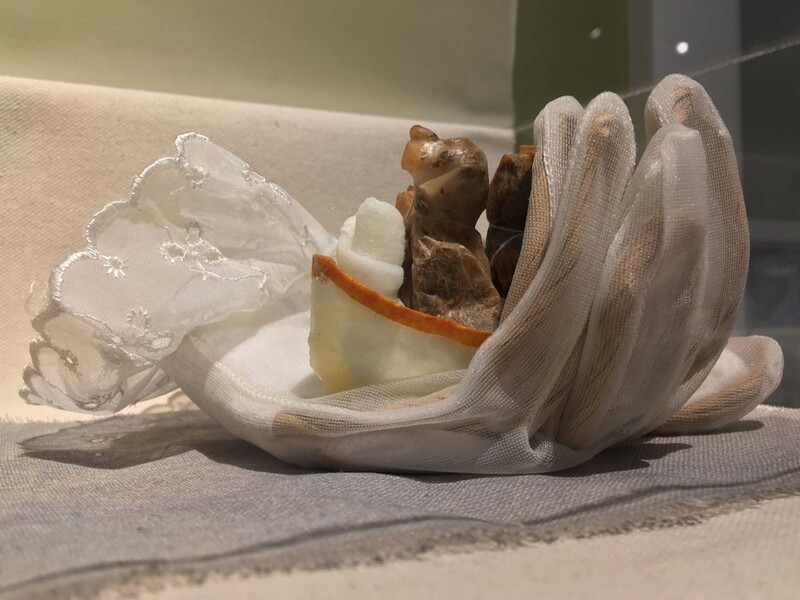 Also included in the exhibit are Syrian textiles on loan from Sparling, a New Haven yoga instructor who traveled to Syria with part-time resident Deborah Felmeth in 2003. There, Sparling writes, she was "bid delicious welcome as a woman, as an American, though Bush had recently declared Syria as the fourth arm of the Axis of Evil." The two women traveled within the country again in 2008; Felmeth's resulting book of photos, Syria — Remember Me, is available for perusal in the gallery. The textiles on view range from contemporary garments to embroidered home décor accents to what Sparling identifies as a rare wool cummerbund. The last item, she explains in her "collector's guide," was woven in a technique no longer practiced and features an embroidered signet. Across the gallery, a delicate, rose-colored camel-hair shawl looks as if it's about to fly away. "World Challenges" is something of a departure for the Sheldon, which has long focused on a broad definition of Vermont folk and decorative arts. This community-sourced exhibition addressing political themes presumably represents the museum staff's need to do something — a sentiment that has become more widespread since November 9. As Ashe put it in a phone call, "This is a beginning, perhaps." Historic Vermont Silhouette Travels to Washington, D.C.